I ended up getting 5 different quotes and had great conversations with only 3 of the 5 suppliers, Patrick from Solaray was one of the suppliers whom I had a great conversation with. Patrick was happy to come over to my place to meet me and answer all my questions. He was also very responsive to follow up questions and competitive with the price the quoted. Once I made my decision to proceed installation was scheduled within 2 business days and the installation happened within a week. Everything went very smoothly and overall it was a very good experience dealing with Solaray. They provided me with all the information I required. The installation went smoothly and to schedule. Prompt service when i was looking for quotes. I ordered a 10kW system. Installation was on time and went well. Very happy overall. Feel confident they have done the job well. I was surprised how much power is produced on overcast days. We have an east facing roof, lots of trees, and only about 3 hrs of direct sunlight on the panels each day, but still get significant input to the system (now late autumn). In late March and early April sunny days, we were able to get peak generation of 3.6 kW and over 20 kWh per day. I purchased a 4.8kW LG NeON 2 and Enphase Microinverter system from Solaray. Their sales person Carlos was the most informed person I spoke to out of all the companies I got in contact with and gave me the confidence to go ahead with them. He was able to talk me though all my options rather than what most sales people do which is try and push you towards whatever is quickest and easiest for them to sell. The installation coordinator Tammy was great and was able to get me booked in for installation very quickly after moving into my new home. The installers were very professional and installed everything very quickly and once they were done you’d wouldn’t have known they’d been there. I look forward to expanding my solar system with Solaray in the future and getting some batteries installed once I have some usage data from the Enphase system. The installers were here on time and finished the installation of 23 panels in less than half a day. So we were generating electricity that afternoon. Tammy, who coordinated everything was very helpful. Came in with best price and greater number of panels when asked for final quote. Installed system exactly when committed to. Competently managed by Tammy. They have a good system for rolling these things out. Excellent and neat installers. System worked immediately. No short supply or hassles of any kind. Very happy and satisfied customer. Just wanted to touch base as the guys have just finished up. I just want to thank you guys for your service so far, it’s been terrific. and were a pleasure to have in our home doing the installation. Thanks again and we look forward to the monitoring software and new meter. We have had excellent service all the way along . From consulting your organisation to installation. Too early to assess system as we have only had installation for less than a week. Very impressed with how well planned and organised Solaray seems to be. The salesman, Carlos, was exceptional. He was extremely patient answering all my ignorant questions thoroughly. He kept on the case and followed through. He even went to the secondhand yard for me and acquired 12 spare tiles before installation. He has subsequently checked on the installation and followed up recently with a phone call to see how things are going. He’s keeping me on track with my usage. During 2 months for searching my solar panel system, i decided to go with micro inverter system hoping i don’t need to clean my panel often and better performance. i got quotes from 7 companies… Tom from Solaray answered tons of questions and give me different quotes upon my request with great patience amd attitude. installation is quick and smooth. Owner Peter is also very helpful. actually my envoy stop reporting data yesterday (19/09/2014) and he drop me a wifi adapter soon after my phone call. It is all good now. New meter was installed just 4 days afterwards. my system perfomance was and is amazing. average power generated for last 6 dyas is 17.65kwh which include 2 cloudy days. can’t be more happier about my choice and solaray’s service. Good thing we choose Solaray. We based our choice from the good reviews and experience from their customers. We found the Solaray team fantastic in almost every aspect….from good salesmanship, service, price, up to installation. We would not hesitate to recommend Solaray to our friends, acquaintances and colleagues. Thanks Solaray. It was very easy from start to finish. You didn’t feel like a number, everyone I spoke too knew my name and treated me as if I was their most important customer. The installer was the nicest tradie I have ever had come to my house. Excellent customer service- outstanding communication and honesty. Peter, the sales guy is also a partner in the business and I found him straightforward, honest and very willing to change designs to suit what I wanted which ended up as a 3.5kW system… The system is recently installed and I am very happy with it and I am also happy to recommend Solaray to other prospective buyers. Mr. Peter Thorne and his team from Solaray were extremely prompt, pleasant and extremely heplful with their recommendation and advice. The feed back and follow up first class. A top professional service at a most competitive price. One could not have wished for a better experience. Response was good. They were able to answer all my questions. Most of the time, I got response back from the supplier within same day. I’ve been contacted and informed every step of the processes. I guess it was easy for me to compare the service level since when I was arranging for solar system installation, also I was getting my roof restoration job done and experience with roof restoration wasn’t good at all. Overall, I am most happy with Solaray’s customer service and hope that I will also see good returns from Solar system in near future. My tip for anyone contemplating solar…. DO YOUR RESEARCH!!! There is a lot of advertising about solar at the moment and using the internet will help you pick the good companies from the one’s you should avoid. Best of luck, and thanks again to… Solaray!! Really good experience from start to finish. Knowledgeable and honest advice, superior products and great service. We couldn’t fault the supplier, staff and the system. We are extremely happy with the solar experience. The team at Solaray have been great so far and offered an excellent system at a great price. I hope the installation team are as good – and of course, the performance of the system, once installed, is what I will have to see. Solaray provided obligation free onsite consultation which I could not get through several other companies. They offered great advice and latest micro inverter technology which is what I was after. The system has only been installed for one week so very early days – and most of these days have been wet or overcast and not much light! The ratings above are thus based on very little time to gauge the true effectiveness of the system. Our dealings with Solaray have, to date, been easy and with clear explanations on the next steps. Communications before install was great. Very quick to install. Done in half a day… Price is quite good compared to many other quotes I got. No hard selling. Salesman a pleasure to deal with. I recommended Solaray to friends and work mates. So hope they treat them well. Need to reply to follow up on customers after install. RECOMMENDED. Peter Thorne and the Solaray team really know their products, their price wasn’t the cheapest but was far more reasonable than 2 others, but the product knowledge was what won me over, the installation team was here when it was arranged, and finished when they said they would. I would recommend them to anyone. I found Soloray to be honest and explain the process fully. I would recommend them. I have also put a deposit down on a 3kw for our farm shed that will be built shortly. Overall they gave me the confidence to go ahead and purchase solar power. Solaray were very efficient. Installed on time. No fuss easy to deal with. Would recommend anytime. Went with Solaray due to price and level of service. Peter Thorne was really professional and knowledgeable. He didn’t push a sale but respected our right to choose. Very happy to recommend. Good sales and service experience. Prompt delivery and installation as promised. From requesting a quote to installation one week – amazing and hassle free. In the end i chose Solaray because they had a better price. Everything went smoothly. The salesperson was not pushy at all. Installation was within a week, all questions were answered promptly. The only negative was that all the warranties and documents were still not received until over 2 weeks since installation and i had to chase up. Not sure what is the standard time frame though. (S….k) and Solaray were very close, personable sales people with excellent product knowledge. Neither were pushy in any way. In the end it was the advantages of the microinverters which gave Solaray the edge. The installation went smoothly, taking only 4 hours. Just waiting for the new meter. An onsite inspection that ensured a system tailored to our needs plus a competitvie price gave Solaray the edge. The first installer arrived on a rainy day and could not start the work. He was concerned about breaking tiles on my roof, so he suggested I buy some more. So I rang several suppliers and was finally able to find one that had my tiles at a reasonable price. On the actual installation day it was a different team that showed up. They told me they would do their best not to break any tiles. At this point I hadn’t received the tiles I ordered. They would not be delivered for another couple of days. So I crossed my fingers and hoped for the best. During 2 months for searching my solar panel system, i decided to go with micro inverter system hoping i don’t need to clean my panel often and better performance. Tom from Solaray answered tons of questions and give me different quotes upon my request with great patience amd attitude. installation is quick and smooth. Owner Peter is also very helpful. actually my envoy stop reporting data yesterday (19/09/2014) and he drop me a wifi adapter soon after my phone call. It is all good now. New meter was installed just 4 days afterwards. my system perfomance was and is amazing. average power generated for last 6 dyas is 17.65kwh which include 2 cloudy days. can’t be more happier about my choice and Solaray’s service. Solaray Energy P/L team was very efficient. They were a happy and friendly lot of blokes and the solar installation on our investment property went extremely smoothly and was finished ahead of time. Very good at helping choose the right system for my roof space, power and cost. Installation hassle free and professional. Value for money: On the proviso that the system works over time. Quality of system: based on research and advice received from Tom Sedgwick. The salesman has a knowledge of the Solar power products and follow up with more information. I was not on site during the installation but my neighbour over- saw the whole process and he was impressed. Professional and friendly service, answered all our questions and was very helpful. We were convinced to go with microinverters and are pleased we did. The service I received from Solaray was fantastic, very nice people and they know their stuff. Arrived on time, explained what they were doing, demonstrated the microinvertors and the internet monitoring. Good followup, they even phoned when monitoring system was not functioning. The system performs seamlessly with the mains power, we have changed the way use the dishwasher and washing machine to utilise the solar power. I would like to be able to use the excess power generated by the panels instead of selling back to the grid. I would have to test the numbers and see if a storage system and more panels is economical. The system has already helped us save considerable amounts on our electricity bill so I am very happy to further recommend going with Solaray… I was very pleased by the service and installation Solaray provided and ended up with a fabulously priced system. I’d highly recommend them! Customer service from Solaray was outstanding. The whole process was very easy and efficient. Solaray were extremely helpful in the design, organising installation, installation, and post installation support to get the monitoring system set up… Solaray were fantastic and I highly recommend using them. They did what they said they’d do when they said they’d do it and for the price they quoted…that’s as good as it gets. (Solaray) fitted the solar panels and invertor, they were on time, professional, did a good job and left the worksite clean and tidy. Solaray have been really good. I already recommended them to my son and would use them again if my workplace permits solar. The quality of the product and the after care service were excellent! We live in a dense inner city area and it is clear that recent technological / reliability advances mean that, even for houses with relatively small roof areas, solar PV is very practical and cost effective. Improved panel technology, more reliable microinverters and the ability to avoid high DC voltages on metal roofs means that there has been a ‘step change’ in the practicality of installing solar PV in inner city areas. Specifically, partial building and tree shading is less of a problem now than with earlier technologies. The Solaray designer noted a potential shadowing issue not noted on other quotes, and suggested a two string install. I felt they took more time to evaluate the site. Professional service, good communications with supplier. Whilst there were a few glitches along the way Solaray responded quickly and resolved matters. I would recommend them as a supplier and use then again if required. I found Solaray to be very professional. Their advice was good, and after accepting their quote, the work was carried out within a week. The installation team was efficient and pleasant to deal with, and the system was installed in half a day , including connection to the grid. We are very happy with our system. We’ve had it for about 12 moths now and no problems. Getting between 30 to 40 kw per day during summer. Good liaison between company and customer. Came when they said they would. Very professional approach, extremely well organized. The (Solaray) response to my enquiry was prompt and the sales team and the installation technicians were courteous and efficient. I am pleased with the recommendation to install micro inverters and the Enphase Enlighten web site gives me confidence of correct operation. They are very professional and fast installation. These guys actually know what they are talking about! Great communication on product details and installation process. While I was already familiar with solar, – I was unsure about which system would be best for me, and how cost effective it would be. The agent – Russell at Solaray explained each stage very clearly and succinctly which gave me confidence in their product. The pros and cons of having inverters at the collection point versus the alternative were laid out in a clear fashion. Solaray rang us the day after my request & didn’t visit us, but instead googled our address & emailed a picture of our roof showing their suggested panel array along with 6 quotes, 3 for string systems & 3 for micro-inverter systems with varied components. The original concept was for 12 panels, but this left no space in one place to clean my gutters from the roof. For this reason we installed only 10 panels which at peak can deliver 2.65 Kw. We opted for Q-cell panels with Enphase micro-inverters. They did the lot, panel installed on 13th Aug & they organised for meter replacement which was done on the 18th Aug. All good. I must add that it was straightforward with a Nth facing tiled roof. I’m now on their list for an Enphase battery when available. No problems installation. Good communication. Roof doesn’t leak after installation. Solaray offered excellent service, clear options and assistance with a litany of questions/clarification and often FUD thrown by some of the industry competitors. Solaray assisted with an unbiased and straight-forward benefits vs cost analysis. We didn’t choose the cheapest system but did choose the right system for our situation – near salt water mist, configuration for maximum production and personal choice on type of installation. While the confusion exists with micro-inverters vs. future batteries, Solaray identified the benefits and risks and outlined in an open and transparent fashion. We have achieved the PV production that we expected given the calculation losses/inefficiencies compared to the peak capability but that was fully disclosed up front. Tom S was a great engagement point on pre-sales and Tammy provided excellent coordination of the installation and made sure the whole process was completed in less than 2.5 weeks. Excellent service from Solaray and would highly recommend. Overall a good experience. Solaray was excellent to deal with and made the process painless with excellent communication to keep us in the loop and totally informed. The customer service… was genuinely very good. They were terrific at contacting us when they said they would, followed up queries professionally, did the job when they said they would. Our installation was delayed slightly due to the weather and they were very good at communicating this and organising alternate dates. Very happy so far, hopefully the after sales service is as good. Heck – I better not start, I would not be able to stop praising. I am currently looking at thee Enlighten (Enphase supplied) monitoring system display on my screen. The Q cell panels are something else. The first 3 days (partially cloudy and overcast) has given me peak energy between 1.6 and 1.8 Kw). One happy customer. I didn’t have any problem with the salesman and the installers. The installers came on time, they were very quick to finish the installations, they finished everything that they have to do on that day, they were professional and I didn’t have any problem ( only that I am still waiting for my receipt for my meter, he said he will email me ) but besides that everything’s went well. So I will just wait and see how much savings I will be getting on my next electricity bill. The Enphase software is excellent – comes with the Microinverters which are more expensive. Am keen to explore the battery addition. Experienced delays in supply of panels and there is a further delay in installation of new meter. All issues have however been handled professionally by the installers, who are responsive and professional. We went with Solaray because their system was well priced, and their salesperson was very helpful and not at all pushy. He answered all of my questions with detailed answers giving me the information I was after. We got an ABB inverter, and Trinia Honey panels. I had a couple of companies offer a better price, but they weren’t able to give me the inverter or panels that I wanted. Once we paid the deposit, the system was installed a week later, which was pretty impressive. Everything was well organised and schedules maintained. Installers were good, polite and neat and tidy. They advised me honestly for what I needed due to shading in my circumstance. Very Happy with… Solaray as my final pick. It is not yet connected as still building but I am going to be assuming it will be as expected and that I will be delighted as I have been with the process of dealing with Solaray. Only fault I can make is the wiring in the roof cavity could have been clipped and therefore neater. Overall from the sales team, installers and accounts, they were a pleasure to deal with especially with all my questions. As I only had the system installed recently, I have received no power bills yet in order to compare the economic effects of having solar power. Software system lets me see how the solar is working. Solaray were very helpful. As a person whom had zero knowledge on solar energy, the Solaray team were able to explain and answer all my questions. A pretty good experience with Solaray throughout the sales and installation cycle. I was very pleased with my dealings with Solaray Energy… The Panels installed seem,according to the Inverter, to be working well. The panels were Q Cells and the inverter was Sungrow. We paid a bit more than what we were intending to spend but I believe that we have purchased the best system on the market (LG 315w panels & Enphase M250 Micro Inverters) that is battery ready… The installers were fantastic: done in 4 hours and they also replaced several damaged tiles that they noticed while on the roof. The salesman was very informative and guided us to various websites where we could research such things as the quality of panels and invertors and the relative merits of string invertors verses micro invertors. We were able to confirm his recommendation from our on-line research and from discussions with their competitors. We did not choose Solaray on the basis of lowest price, we chose on the basis of value for money and our perception of Solarays professionalism. Overall I had a very good experience with Solaray. Some inevitable issues were encountered along the way, but Solaray staff took a reasonable and balanced approach to resolving them – and they did get resolved. 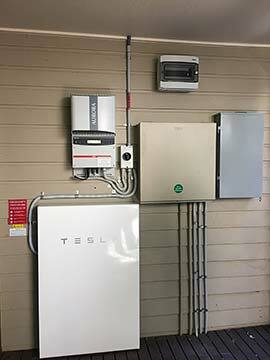 I purchased a 10kW 3-phase system (38 Trina panels, Fronius Symo 10 + Fronius Smart Meter). Tom S, the Solaray Salesperson I dealt with, was a particularly “straight-up” guy and one of the least “salespersony” salespersons I’ve dealt with in a while. This was a big plus for me, and a credit to Tom. So far, I’m a very happy Solaray customer. I had 2 quotes for the exact same system and one supplier was $1500 more expensive than Solaray. But even more importantly Solaray checked our roof via Google Maps and instantly said that we had to go for microinverters instead of a central inverter with several strings because of the layout of the panels and limited roof space. The other supplier did not mention this and in my view that was a big mistake. Basically for everyone reading this if you have lets say 10 panels and have e.g. 4 panels on the north, 4 panels on the west and 2 on the east you need to go for a microinverter system (Enphase). Installation went smooth and no broken roof tiles etc etc. Just very professional and no fuss. I certainly would recommend Solaray. I had been shopping for quite a while for solar. Some companies who use consultants to sell packages were more that $2000 more expensive, along with pressures to sign on the dotted line. Some companies had absolutely no idea on customer service. I happened to come across Solaray and I am glad that I did. I paid perhaps and extra $500 (perhaps, as all systems are slightly different). This gave me peace of mind to deal with a respectable company who did what they said that they would do. Every step of the way was easy, great communication, install guys where efficient and cleaned up after themselves, metering was done with ease as well. I was told by the installer that Solaray was one of the few companies who came out to repair their installs as opposed to referring to the manufacturer. We were very happy with the sales person and his advice on the type of system we chose. He was not pushy and gave us the facts, so we could make an informed decision. The office and support staff were very helpful. The installation went smoothly. We now await our first power bill to see how efficient the solar panels are. By all accounts the Enphase monitoring system is showing what we are not using is going back to the grid, so we are hopeful of a reduction in our power bill. Thanks Solaray for your service. Everything was done quickly and professionally. The whole system was installed within 2 weeks. There was a problem with the meter to start with but that has since been fixed. There was a follow up call to see how things were going and I am pretty happy with the system so far. The salesman was quietly persistent, calling back at irregular intervals – no hard sell, just answered my questions… The guys we had were on-site for only 6.5 hours, were most professional, & left our site as clean as they found it. I felt comfortable through the whole process from when I put “pen-to-paper”, so to speak, to when the technician arrived 4 days after the install to change over the meter. Rather early days yet but as far as we can tell the system output is what it should be and we like being able to monitor easily. Installation was handled and scheduled most professionally which gives us more confidence that we have made the right choice. We would like to thank you for the fantastic and professional job both you and your team have done in getting our Solar System organised and installed without a single hiccup along the way. The installation guys were fantastic we had no idea that they were here and cleaned up as if they never arrived we are very happy thank you! Just a short note to say how pleased I am with the system you installed. It starts right on sunrise and off up to 10min after sunset. Makes approx 21kWh on good days.